Did undue political influence cost many retirees their pensions? Former Delphi CEO Steve Miller initially promised to keep both blue- and white-collar pension programs once he got the partsmaker out of Chapter 11. A new federal investigation is underway, looking at whether undue political influence ultimately cost thousands of Delphi retirees a large chunk of their pensions. An independent counsel has been brought in to review a controversial decision by the Pension Benefit Guarantee Corp., or PBGC, to assume control of the Delphi Corp. salaried pension program as the supplier finally emerged from its long run through bankruptcy. Neil M. Barofsky, a special inspector general for the Troubled Asset Relief Program, said, in a letter to a New York congressman, that his office would examine whether officials from the Treasury Department’s automotive task force — or the White House — pressured General Motors to protect the pensions of Delphi’s blue collar workers, while the PBGC slashed the pensions of salaried employees. There’s no question there were a lot of vested parties desperately hoping to drag Delphi out of its Chapter 11 quagmire, last year, the longest any major industrial company had ever been caught in the bankruptcy process. Last year’s PBGC takeover of the Delphi salaried fund translated into steep cuts in benefits, ranging from 30% to 70% for all of Delphi’s salaried retirees, who also lost their health-care coverage. 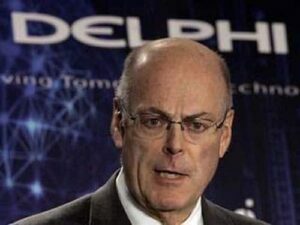 Delphi’s former white-collar employees have gone to court in an effort to restore the pensions. Up until now, the position of General Motors , which spun-off Delphi more than a decade ago, has been that while many of the retirees originally had been GM employees, the salaried pension fund for them was fully-funded when it was handed over to Delphi in 1999. What happened to the salaried pension program after that, the carmaker says, was not GM’s responsibility. On the other hand, Delphi’s hourly pension fund was in a somewhat different position. Responsibility for blue-collar pensions was shared by Delphi and GM because of very specific language in the agreement the automaker signed with the UAW, GM officials have emphasized. One year before the PBGC swooped in and took over the salaried pension fund, Delphi’s board of directors had issued a statement insisting that the bankrupt company was prepared to honor all of its pension commitments. Why that changed last year is the question at the heart of the independent counsel’s new investigation. It was pretty clear at the time that statement was made, in May, 2008, with George W. Bush still in the White House, that the PBGC was very concerned about the overall health of the Delphi pension plans and feared they could implode. GM has not yet responded publicly to Levin’s letter.